Acquired: Selected in the fourth round (31st overall) in the 2017 CFL Draft. Signed on May 23, 2017. 2018: In 18 games (three starts), Hoover has 11 defensive tackles and nine special teams tackles. 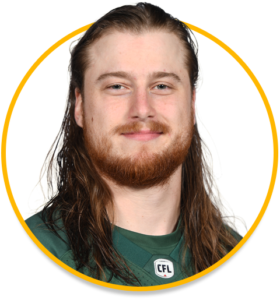 2017: In 17 games, the Green and Gold rookie finished with nine tackles, including eight special teams tackles. In the West Semi-Final, Hoover recorded one special teams tackle and appeared in the West Final. College: Hoover spent four seasons at the University of Waterloo and lead the CIS in interceptions during the 2015 season with five. Hoover turned heads at the Ontario Region Combine where he ran a 4.03-second shuttle – fourth fastest for a DB.